This is such a great recipe to prepare the night before and let it cook all day while I’m out! For especially busy days this is one of our favorites. It also provides lots of leftovers for lunches. Sometimes I make a large enough batch that I freeze some of the leftovers for quick ready made freezer meals! It’s easy to re-heat and serve! I often will add a little water and put in a wok or stew pot on the stove to warm and it tastes as if it were just made! This is also a good pre-vacation meal. It’s great to have this cooking while I’m cleaning and packing trying to get us ready to be on our way for camping or vacationing elsewhere. We will be able to have a great hearty meal before leaving and another meal for the week already made! This is one of our favorites if you can’t tell! 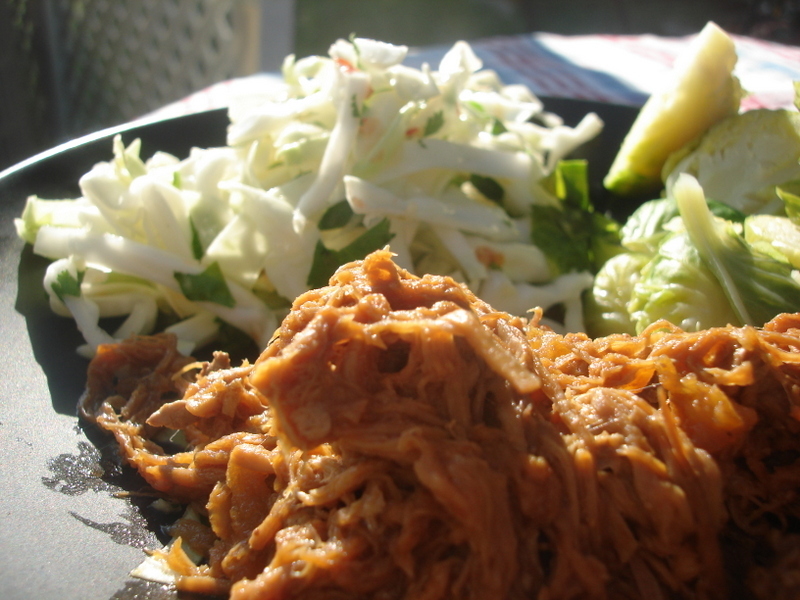 I have been a huge fan of pulled pork sandwiches in the past which often have a lot of brown sugar added or barbeque sauce which also has a lot of sugar and other stuff in it… this recipe has been a good paleo substitute for us! The apples make it sweet and it has lots of flavor with all the added spices. It’s making my mouth water just thinking about it! Put the fennel seeds, peppercorns, thyme and rosemary leaves, garlic, mustard and 2 teaspoons salt into a spice grinder or coffee grinder and grind to a paste. Alternatively, you can pound the mixture with a mortar and pestle. Put the mixture into a bowl and stir in 2 tablespoons olive oil. Rub the mixture evenly all over the pork shoulder. If the roast is tied, untie it to rub the inside with the rub mixture as well. Wrap the roast tightly in plastic wrap to hold the rub against the skin and marinate overnight (or up to two days). Peel, halve, and core the apples. Cut each apple half into about 4 wedges. Peel the onions. Cut in half from tip to root. Cut each onion half into about 12 thin wedges. Put the onions and the apples together in crock pot. Toss the apples and onions with 2 tablespoons of olive oil and season with a little salt and pepper. Place the marinated pork shoulder on top of the apples and onions. Cook in crockpot on low for 8 hours or on high for about 4 hours. Yield: Serves 4-6 with leftovers. If you give this a try, please let us know what you think or what you’ve changed to make it even more tasty!